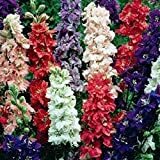 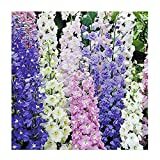 Delphinium Giant Imperial Mix Seeds, Organic 500+ Seeds, Beautiful Multi Colored Blooms. 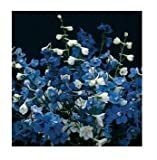 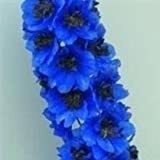 Delphinium seeds for sale – Easy plant to grow, mostly grown for the ornamental flowers, planting in early spring to summer when buy seeds. 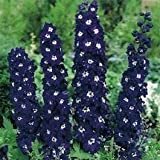 Growing information: perennial plant, growing hardiness zone: 3-10, water needed – average to big amount, light conditions – full sun to partial shade, height: 0.7-2m, 2-6 feet. 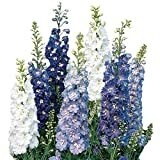 Blooming in the spring to summer in saucer shaped flowers that appear in blue, purple, pink or white color. 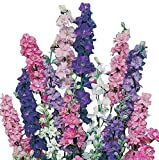 Sowing in the spring to summer, plant in full sun to partial shade, moist soil, in slightly alkaline soil, deep 1-2cm.